We both like to listen to Web radio while we work. We were particularly pleased to discover that Radio Classique, which we listen to in Paris (at call number 101.1) is available on the Internet. (Go to the site, click on “En direct” and then choose “Haut débit” or “Bas débit” and it will begin.) The music is enjoyable and you can practise your French comprehension by listening to the news broadcasts or the occasional interview. We also have Apple computers, which offer umpteen different music streams from the radio available through iTunes. The other day, more or less at random, I chose AAA Classic, which makes up in its imaginative choice of music what it lacks in its pedestrian choice of name. It is a French station, and every so often I had to stop what I was doing to look at the little window that identified the music being played. The first time, it turned out to be a piece called “Crime aux Champs-Elysées” by someone called Georges Delerue – a jazzy little number straight from a film noir. Later that day, I heard a quaint little accordion tune on the same channel. This one was called “Pissenlits par la Racine” and it was by the same fellow. Georges Delerue. Hm. First of all, what did the song title mean? Le Petit Robert dictionary came to the rescue. I knew that pissenlits were dandelions, but I didn’t know that “manger les pissenlits par la racine” (to eat dandelion salad by the roots) is a colourful expression meaning to be dead and buried. The movie is a black comedy featuring a dead body. Then I needed to find out more about the composer Delerue. Why had I never heard of him? Eventually I found an entire website devoted to the man and his music. He was born in 1925 in the town of Roubaix, way in the north of France, close to the border with Belgium. His father was a factory foreman and he went to work in the factory in 1940 when he was in his mid teens, but studied music part-time. It took some time for his music teachers to realize that he had talent. In fact, at one point he was actively discouraged from continuing, and it was only the sudden death of an unsympathetic teacher that made it possible for him to carry on. When the war ended in 1945, he went to Paris to study at the Conservatoire, and in time became amazingly prolific. He poured out works for ballet and theatre, concert pieces, musical scores for about 350 films, even music for commercials. 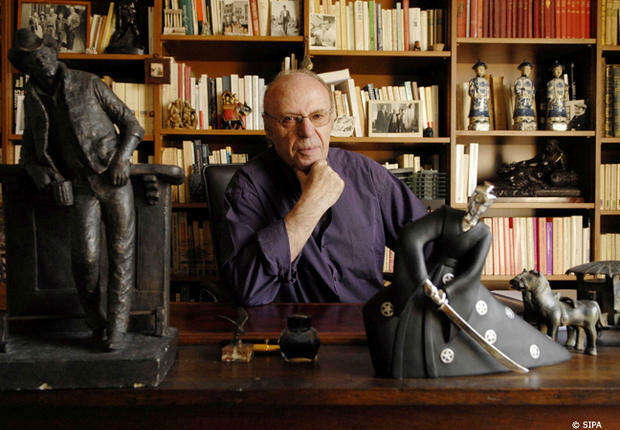 He worked with François Truffaut (Jules et Jim, Shoot the Piano Player, Le Dernier Métro), Jean-Luc Godard (Le Mépris), and many other well-known French directors. Then he went to Hollywood. At that point, I spotted something that sent my thoughts off in a new direction. In 1979 Delerue had won an Academy Award for the film A Little Romance directed by George Roy Hill. Goodness me. That took me back. I remember the film well. 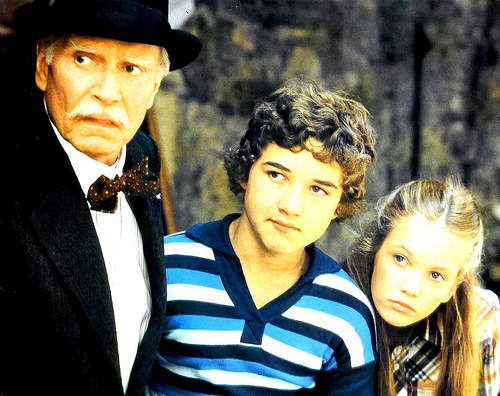 It starred a seventysomething Laurence Olivier, a 13-year-old Diane Lane, and a young French boy with the extraordinary name of Thelonious Bernard. You can see the trailer on YouTube. Oh, I loved that film. It was charming and touching and summed up all the romance of Paris for me – even though the most romantic part of all takes place in Venice. Two precociously bright teenagers fall in love and run away together, helped by a kindly if unreliable old gent (Olivier), while evading disapproving parents and others who don’t fully understand their intelligence and intellectual interests. She is the daughter of wealthy Americans; he comes from a working-class Paris suburb. 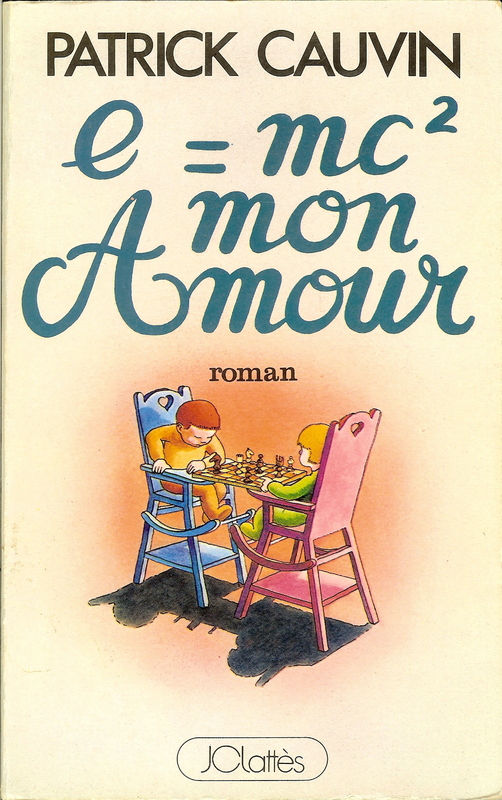 I found the film so delightful that when I went to France as a student, I hunted up a copy of the book on which the film was based: e = mc2, mon amour by Patrick Cauvin. I still have it. The book was important to me, because it was the first one I read in French that was not something on a course syllabus, and because it was written from the point of view of the two teenagers, and the French is very colloquial. The very first line in the book is: “L’année scolaire se tire des pattes.” That sent me scurrying to Le Petit Robert. “Se tirer des pattes de quelqu’un” means to get out of someone’s clutches, so it’s a way of saying the school year is ending. It took me weeks to get through that book. I had to look up something in every paragraph, if not every sentence. But I enjoyed it so much I that when I finished it, I bought another by Patrick Cauvin (Huit jours en été) and repeated the whole process. Cauvin (whose real name was Claude Klotz) was as prolific as Delerue in his way, and churned out dozens of novels under both names. He wrote hard-boiled, violent thrillers as Klotz and tender romances as Cauvin. When he wasn’t teaching French in a lycée, that is. You can see a list of his books here. He even wrote a sequel to e = mc2, mon amour called Pythagore, je t’adore. At the time, though, I knew none of this. Having rediscovered the movie, I wondered what had happened to that delightful young man called Thelonious Bernard from A Little Romance. Diane Lane went on to make many more films; what did he do? Although he pretty much steals the film, he made one more movie, then decided that the life of an actor was not for him. He went back to his studies and became a dentist. According to the Internet Movie Database, he lives in Nantes with his wife and family. What a delightful ending to the story. Unlike those former child stars who try and often fail to stay in the limelight, he firmly closed the door and went back to private life. How very sensible and, in some ways, how very French. Good for him. I cannot forget the last frame in the film. As the young American girl drives off with her parents, on their way to the airport and back to the States, he runs after the car. When another car pulls in front, he hops up and down to get a last glimpse of her. The film freezes on this image of him in mid-hop. The music playing behind this scene is not that of Georges Delerue, but a quiet bit of Vivaldi. There is a lot of Vivaldi in the film. 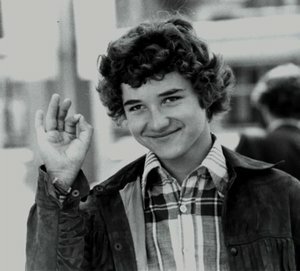 Despite Delerue’s Academy Award, all I remember is the Vivaldi. Georges Delerue died of a heart attack in Los Angeles in 1992, at the age of 67. He had just finished recording the music for a Bruce Beresford film. 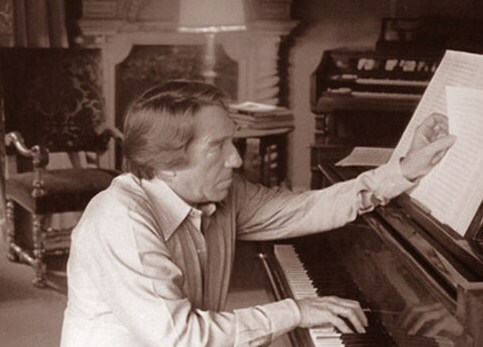 Patrick Cauvin/Claude Klotz died in 2010, aged 77. I wonder if they met during the filming of A Little Romance. And if so, whether they found they had anything in common. How odd to be remembering books I read years ago and movies I loved, all because of a piece of music I heard on AAA Classic. But that’s the way the memory – or at least my memory – tends to work. One thing always leads to another. This entry was posted in Paris film, Paris music and tagged A Little Romance, Claude Klotz, Crime aux Champs-Elysées, Diane Lane, e = mc2 mon amour, François Truffaut, Georges Delerue, Geroge Roy Hill, Laurence Olivier, Le Mépris, Patrick Cauvin, Pissenlits par la Racine, Thelonious Bernard. Bookmark the permalink. Lovely post! I enjoyed checking out Radio Classique. Philippa, I think I may have been sitting near you on the subway recently. Garry and I love “A Little Romance.” I’ve always wondered why it’s shown so rarely. It’s a gem of a movie, one of Hill’s best. The story is charming, the settings are deliciously romantic, Olivier is Olivier — and the two kids will make you nostalgic about being youn. If you can, see this one! “A Little Romance” is an absolute gem. Whether you’re 13 or 83, it leaves you smiling. It’s a cinematic love song without any baggage. Hi everybody, what a wonderful Movie A Little Romance. Good Old Days. What happened to this Boy??? why he stopped his career in early Age ???? Looked up Thelonious Bernard. What a cute actor. Good for him to go on with his life. I never realized Diane Lane started acting so young. I enjoyed A Little Romance. Wouldn’t you like to see the same two characters (actors) reunite for a sequel of their lives in the subsequent years???? Some needs to write a screenplay………………………………………..! Hello, I’m chiming in a bit late, but I’m also a devotee of “A Little Romance”. I saw it in a theatre shortly after it premiered in 1979, I was 20 years old and still holding close, memories of my first love eight years earlier. He was 13, I was 12. and I was in love. Puppy love? Hardly, this was as real as the newly formed pimples on my chin. But like most first loves, it was destined to fail, but is memory would never….could never die. He and I reconnected via phone and text a few years ago, we both admitted we were and would be pivotal poetiins in each other’s youthful memory banks, but we’d grown up differently. He got married, had kids; I went to university majored in broadcast journalism and traveled quite a bit. First loves are so wonderfully heartbreaking, which is why “A Little Romance” resonated with me. I watch it whenever I can. It reminds me of what an innocent, purely idealized love is like without mortgages, debt, disapproving in laws, waiting in school carpool lanes, the distance that invariably, always arises — you know, love before being ‘marred’ by adulthood. Don’t get me wrong, a mature love is a wonderful thing, but also flawed. First loves are flawed only when they end. What a wonderful and thoughtful reflection. Thank you for chiming in…and there is no such thing as “late” in these matters! I have just started learning about Torrents and got myself this movie but, at first, I had watched it in an AMC Theatre in Fashion Valley in San Diego when I was 24. It charmed me off my seat. Being a late bloomer, I have a daughter who is only 8 and also a teenager 16 (girl), who eagerly imitates western culture from somewhere in the middle of Africa. I can show the movie to my 16-year old and want to do so but I don’t think it will be good enough for my 8-year old. The kissing part still makes me feel uncomfortable! :o) but, of course, it has to be there. What is so much more romantic about finding that you have a high IQ way above those of your classmates that suddenly brings you together? That is an existential question! I went back to the internet after watching the movie to see what Diane looks like today. She is just as sensitive-looking as wished for and I wish her every happiness. I had been an exchange student to Brest, France when I was 16 in 1976. I saw this movie in a theatre with my mom and brother when I was 19….I cried it was so sweet 🙂 Just watched it again…it’s still as sweet as ever to me. I came here also during my search for Thelonius. What a wonderful film this is. Sad and sweet, it connects me with my youth. George Roy Hill was an amazing director. Between this film, The Great Waldo Pepper, Slaughterhouse-Five, and The Sting he’s made some of my favorite films. and Delerue were with me all along. Thanks for the post. I was looking up information on A Little Romance today and came across your delightful post. This is one of my favorite movies of all time, and I truly enjoyed reading this. I’m jealous that I don’t speak french and can’t read the book.